What value does an undrafted mature age player have? For the past three decades the AFL has struggled with how to boost new and struggling clubs at their time of greatest need. The league has experimented with exclusive recruitment zones (for all non-Vic clubs), various forms of priority picks, extra tradeable picks (such as minidraft selections) and the right to sign and trade mature age players from outside the AFL system. Each of these have had varying levels of success over the years, largely influenced by the staff hired by each club and the strength of the draft classes available to them. At the end of the 2018 Home and Away season, three clubs applied for priority picks, in order to help them address a systemic imbalance that they have been facing and to help them rebuild. All three (Carlton, Gold Coast and Brisbane) were knocked back. The AFL’s chosen concessions to Gold Coast and Carlton, available in lieu of priority picks, were the ability to sign three and two mature aged players respectively. This is similar to some of the concessions granted to Port Adelaide, Fremantle, Gold Coast and GWS upon their entry to the league. These are players who were previously in the AFL draft and went unselected. By definition, every club has already chosen not to draft them at least once. The clubs have the ability to retain or on-trade these selected players, and the fact that they can be traded means they’re a live currency and have some exchange value. But what should they be regarded as being worth? We can look to recent history to answer this. 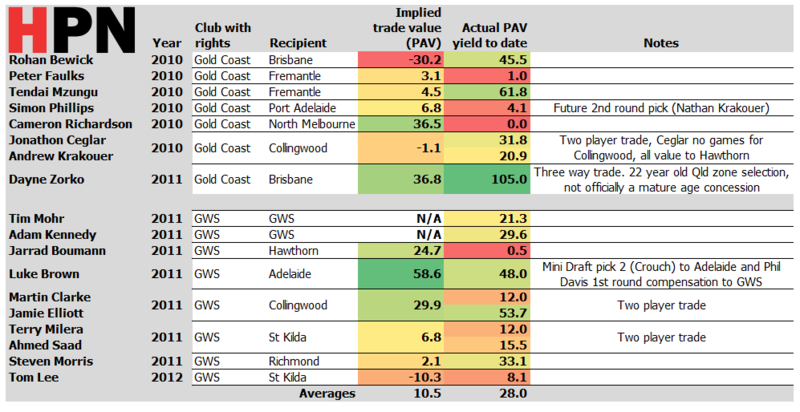 These selections have a direct precedent in startup concessions available to Gold Coast and GWS in their first two AFL trade periods. Each club was permitted to sign up to 10 players who had previously nominated for the draft. Gold Coast signed and traded all seven of their selections, while GWS kept two players (Tim Mohr and Adam Kennedy) and traded the rest. During this time, Dayne Zorko was also signed and traded by the Suns to the Lions as a Queensland zone pick, but given he was 22, the lone non-teenaged zone pick, he fits the bill as an overlooked draftee from the same era and we’ve included him in our analysis. Draft-aged zone picks such as the on-traded Jake Neade and Peter Yagmoor, and the retained Anthony Miles, have been excluded. Implied value is the value of a player suggested through a trade by deducting the other components. For example, Tendai Mzungu and 44 were traded for 38, which implies he was valued at about 4.5 Player Approximate Value (PAV) – the difference in the expected value of those two picks. Below is a summary of the mature aged concession selections from 2010 to 2012, their trade value when they were traded, and their eventual output. There is some rumour that the Jared Brennan recruitment by the Suns influenced the Bewick deal. The most complex trade was Luke Brown and pick two of the Minidraft (used on Brad Crouch), in exchange for pick 10 and the Adelaide-tied first round compensation pick for Phil Davis. For the record we’ve valued Minidraft pick 2 at pick 6 due to the one-third size of the pool (players born January to April), and the Phil Davis compensation at the pick 11 (note: an earlier version wrongly said pick 7) it would have been if activated the year it was obtained, although in reality it slid to pick 20 in a bloated first round the following year. Actual PAV is simply what the player ended up producing, in Player Approximate Value terms. It shows us that overall, despite being limited to players who were previously overlooked in the draft, this method of player acquisition had a surprisingly good strike rate in finding players capable of some senior footy. Less than half of the 18 players could be said to have washed out. Six (Ceglar, Elliot, Brown, Mohr and Kennedy from the mature age concessions, plus Zorko) are still going, while Mzungu, Morris and Bewick also gave decent service for a time. Andrew Krakouer was an older pick returning to football after time in jail, and played until age 30. Ahmed Saad’s doping infraction derailing his career could hardly have been forseen, and Martin Clarke returned to Ireland and made an All-Ireland Football final with Down. Dayne Zorko was the lone non-teenage zone pick to be selected by either club. Sent to the Lions at age 22 after being skipped over by the Suns twice, his own coach at Broadbeach cited discpline and fitness as having ruled him out from the Suns in prior years to 2011, though this doesn’t explain them passing him on the year they picked him. Zorko fits the profile of the overage former draft nominee, and at 105 career PAV to date and four best-and-fairest medals on the trot, he has been more successful than any player discussed above. Zorko represents the current best case scenario for the concessions given to Gold Coast and Carlton. On average, the mature age concession players were not traded for very much value, just 10.5 PAV on average. The swaps were often either pick upgrades or a direct trade for a later pick. Clubs gave up, on average, roughly the value we assign pick 89. That’s a pick which only rarely produces live value and if traded, represents pretty much the opportunity cost of filling a list spot otherwise filled by the draft. The chart above contains negative implied values, showing that a couple of clubs actually gave up less expected value in their exchange than the Suns or Giants did, even without assigning any value to the player. The GWS trade with St Kilda for Tom Lee is explained by the Giants not intending to use the pick 45 they gave up (they took six picks before it) while the Collingwood swap with Gold Coast is only slightly negative based on there being two pretty worthless picks in the bundle they received. As a direct pick swap without Bewick, those picks already favoured the Lions, with the only upside for the Suns being shifting a pick into the future via the Brennan end of first round compensation pick. Jared Brennan was a second uncontracted Lions player to sign for the Suns, after Rischitelli, and Brisbane had discretion about whether to release him to the Suns. This trade, where Brisbane gave the compensation pick straight back to Gold Coast, was clearly the makeweight for that decision. Who are the 2018 mature age concessions? Gold Coast have so far signed Josh Corbett from Werribee and Chris Burgess from West Adelaide, while the Blues have signed South Adelaide’s Nathan Kreuger and traded him to Geelong. One of the two clubs will also sign Shane McAdam (if Carlton do, it will be on behalf of Adelaide). Josh Corbett is a 22 year old mid-sized forward whose name was being mentioned as early as January as a likely AFL selection in the upcoming draft. He won the VFL’s equivalent to the Rising Star, the Fothergill–Round-Mitchell Medal this year. Corbett was routinely mentioned in the top 30 of various phantom drafts this year, and was a very outside shot of being picked up in the late first round. Chris Burgess is described as a “swingman” or “key position player” for West Adelaide who progressed outside the SANFL junior system. He only started at SANFL level in 2016 as a 20 year old having played in local amateur footy before that. This year he was invited to the South Australian state combine. Nathan Kreuger, traded to Geelong, is a key forward who at 19 was considered well within the draft frame already, having played in the 2017 Under 18 National Championships and like Burgess was invited to the state combine this year. Kreuger was listed in some phantom drafts in 2017 – most notably at pick 71 in Chris Doerre’s (Knightmare’s) for ESPN. Kreuger kicked 22 goals in 13 games this year, which is solid for a youngster playing against adult defenders, but not outstanding in its own terms. It’s roughly the level produced by former AFL players John Butcher and Keenan Ramsay, and well behind others such as Simon Phillips and Terry Milera. His tally is also well behind McAdam – who will get immediate games if he signs with Gold Coast. McAdam, like Corbett, got a call up to the national combine, and was in line for a selection in the national draft this year. Nothing, since there was no real opportunity cost. The value of pick 90 (10.3 PAV), since the clubs have filled a list spot which would otherwise be filled with the last available draft pick. The average of 2010-12 concession trade values, as estimated above (10.5 PAV). The pick value of the players’ positions on any reputable draft power rankings or phantom drafts, if any were available. The value realised through an actual trade. Carlton gave up nothing except Kreuger himself to get pick 42, so that’s basically a free pick 42 for them while providing us the Cats’ valuation of him. We’ve held the trade to tell us the valuation for Kreuger, which makes it definitionally fair, but the trade is on the high end of those we discussed above. It’s nearly equivalent to the North Melbourne swap of pick 35 for Cameron Richardson in 2010. This swap suggests that either perceptions about mature agers have shifted and their market value has increased, or that the Cats see him as less of a speculative punt than some players were back in 2010 to 2012. As a 19 year old who only technically qualifies as “mature age”, he’s been treated here as more of a conventional candidate for a third round draft selection than as a speculative punt on an older player.